Chichester Runners & AC young athlete Fleur Hollyer competed in the annual indoor open combined events meeting at the Lee Valley Athletics Centre Indoor in London. 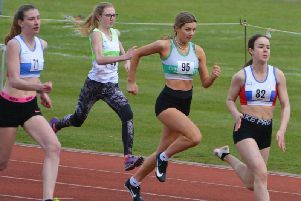 Although winter weather and other factors had restricted her technical training, it was a very rewarding day as she notched four new personal best performances in the under-15 girls’ pentathlon. Using starting blocks for the first time in a 60m hurdles, she stopped the clock at 10.75sec, just short of her previous best. This was followed by a new 1.32m PB in the high jump, along with a PB 5.94m in the shot. Next up was the long jump, with another PB 4.21m jump. She ended the day with a well-executed plan in the 800m, which saw her record a PB 2min 48.01sec to take her points total to a personal-best 2,115.